Because all patients, including babies, can’t eat before surgery, breastfeeding must be delayed for a period of time prior to surgery. In most cases, babies can return to breastfeeding once they are awake enough to drink liquids without problems. The baby’s nurse or doctor will let the mother know when her baby is ready to nurse. Mothers should speak with their doctors or a lactation consultant about pumping and keeping up their milk supply while their babies are fasting and in surgery. “If the mother can pump and save the breast milk, our Neonatal Intensive Care Unit will save the milk for when the baby can eat. Breast milk has huge immune system benefits that can’t be mimicked by alternatives,” says Dr. Kabeer. An innovator in medicine, Dr. Mustafa Kabeer has been a leader in the research of surgical robotics and was the first physician to perform robotic surgery at CHOC. He has since performed many different types of operations using robotics. 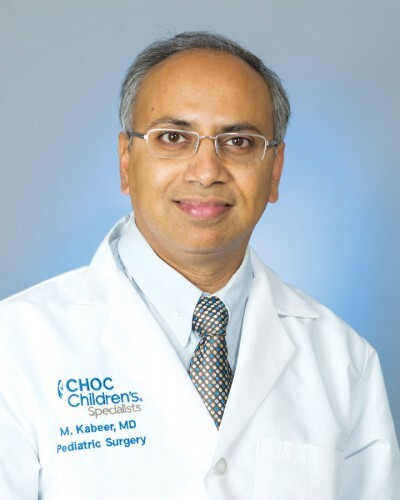 Dr. Kabeer completed both his internship and his residency training at Indiana University and served his fellowship at the Children’s Hospital of Michigan. Dr. Kabeer, with Dr. Irfan Ahmad, a neonatologist, are the co-directors of the Surgical Neonatal Intensive Care Unit at CHOC. Dr. Kabeer also is a Clinical Assistant Professor of Surgery at the University of California, Irvine, Medical School. Infants needing surgery require special attention, and a unique feature of CHOC’s Neonatal Intensive Care Unit (NICU) provides just that. CHOC’s Surgical NICU, one of the only two Surgical NICUs like it at any children’s hospital in the country, is a dedicated space within the NICU that uses a comprehensive approach to care for these tiny patients. A coordinated treatment protocol – used in many adult intensive care units nationwide – has shown to result in fewer patient complications, better outcomes and faster discharges. And, CHOC’s Surgical NICU physicians and staff continue to research new ways to make the care even better. More from our experts about caring for your infant. Dr. Vijay Dhar, medical director of the CHOC Children’s NICU, understands the fear and anxiety experienced by parents of NICU patients. As a neonatologist with 28 years of experience, Dr. Dhar advises parents to ask their care team the following questions to help alleviate some of that anxiety. Just steps away from St. Joseph Hospital’s postpartum unit, our 13-bed, level II neonatal intensive care unit (NICU) keeps newborns and parents close together. 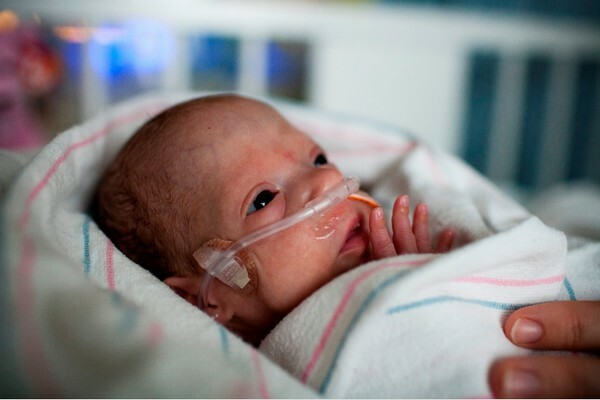 The CHOC NICU at St. Joseph Hospital is staffed by CHOC’s premier team of neonatal experts—and is specially equipped to care for newborns with low to moderate medical needs. Surgery can be stressful for babies, but unlike older children, caregivers cannot fully explain to the infant what will be happening. Read this guide to understand some of the reasons that infants may feel stress and learn ways you can help provide reassurance and comfort.